HEADDRESS FOR FIELD EXERCISES AND FOUL WEATHER. While officers of heavy cavalry and hussars removed plumes from their headdresses when on field manouevres or in bad weather, lancer officers had different alternatives. Firstly, as mentioned before the plumes worn on the full dress caps were, in dress regulations, required to be of horsehair while the feather plumes were reserved for levees and parades. As full dress uniforms are the first to be described in our presentation, we omitted the caps with horsehair plumes there and are including them in this section. An example of the 5th (Royal Irish Lancers) is displayed in the plate. 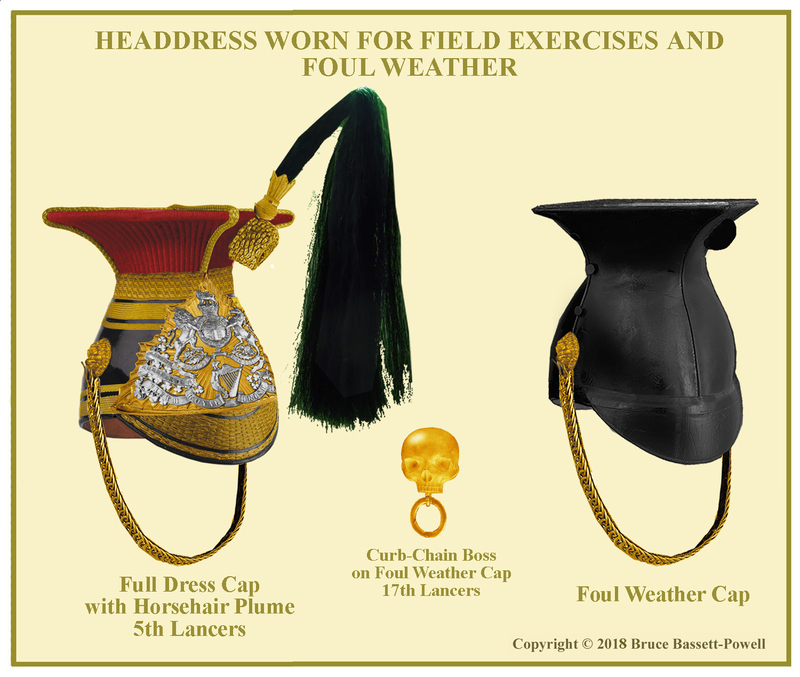 A headdress item unique to lancer regiments was the foul-weather cap which first appeared as early as 1822. In its essentials, the cap was constructed the same way, despite the changing dimensions, right up to the Great War. The cap was never mentioned in dress regulations after 1856 but it was to be of thin material covered in oilskin, cut into four quarters on the skull and top with three false bone buttons down each side. The padded peak was also covered as was a purely cosmetic rosette boss (more like a “bump”) on the left upper quadrant. The curb chain and side bosses were the same as on the full dress cap, including the 9th lancers corded version. The 17th Lancers had gilt skulls instead of the lion’s head bosses. The field service caps followed the same pattern as for other services. In the case of lancers they were to be the same as for Dragoon Guards and Dragoons in blue cloth except for the 12th Lancers whose cap was scarlet. 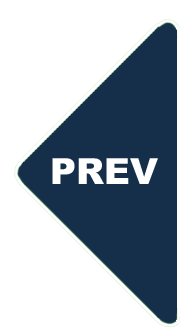 Existing examples show that regiments varied. The 16th Lancers had a scarlet body with blue flaps and the 17th lancers had a white body. By the late 1880s it appears that 5th and 9th lancers may have followed the 16th Lancers with scarlet bodies. 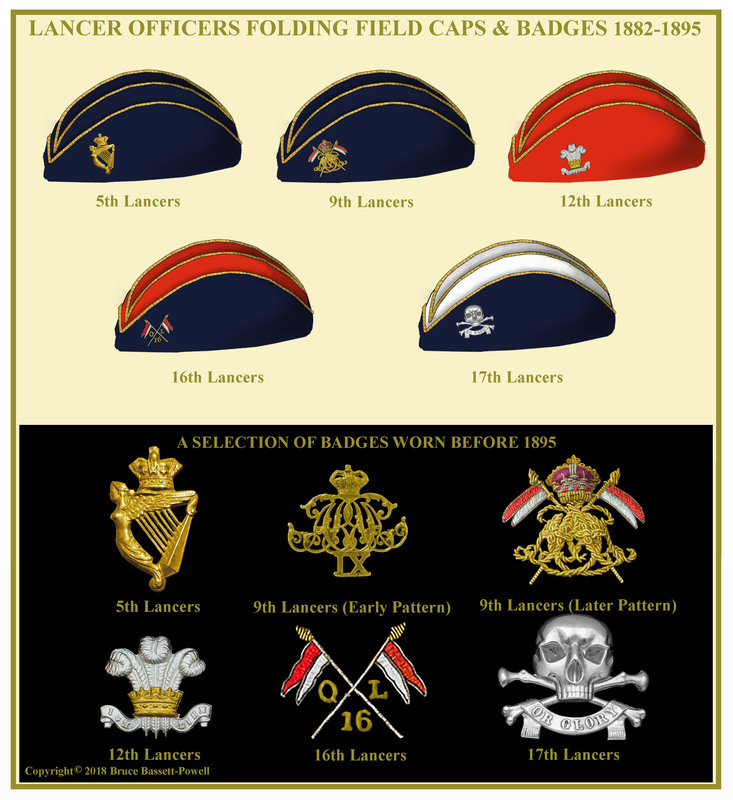 When the folding field cap was authorised in 1896 all the lancer regiments were to wear caps with scarlet bodies and blue flaps except the 17th. However, the 12th continued to wear all scarlet caps. When the 21st Hussars were reequipped as Lancers, they had a French Grey body with blue flaps. The badges on the early Torin caps are difficult to pin down and some speculation is needed. The 12th did use the Harp at one time, but an embroidered badge which may have been the same as that worn on the new folding field cap may have been adopted earlier. The 9th had Princess Adelaide’s Cypher for some time, but also replaced it with an embroidered badge later as did the 16th. The 17th stuck with the Motto on all caps. 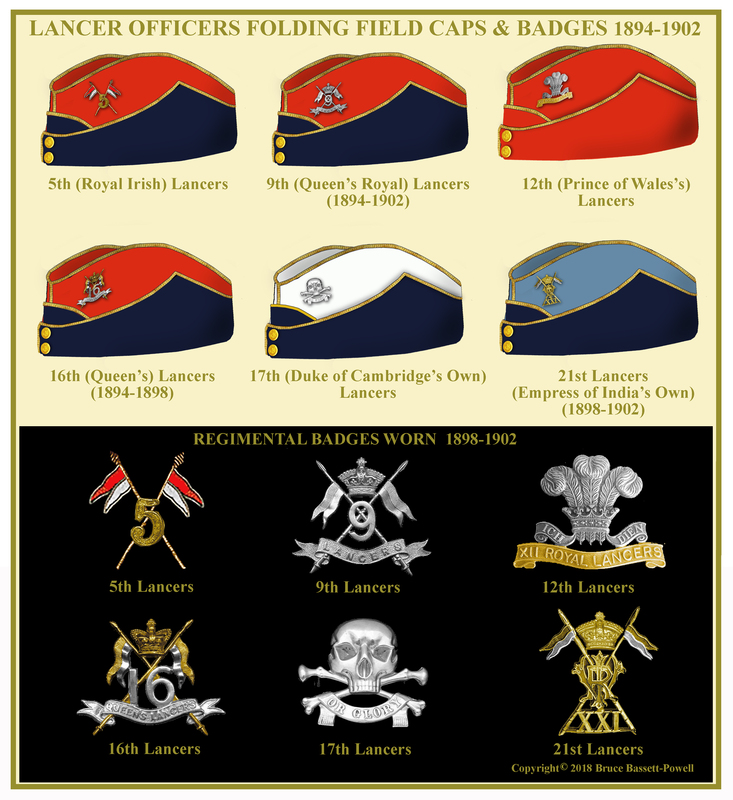 By the 1900 regulations, all regiments had metal badges except the 5th Lancers who retained the embroidered one. They did change to a gilt version later. 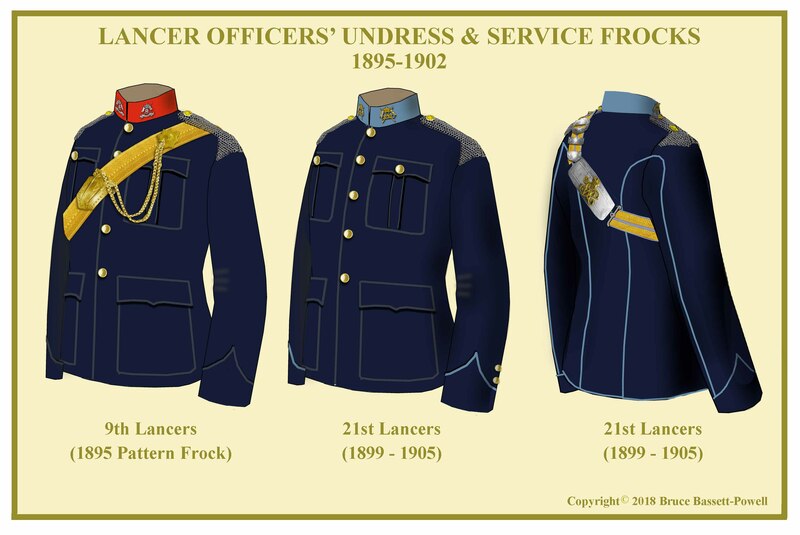 Like the lancer cap, the unique nature of the Lancer tunic led to a dual purpose description in the 1883 dress regulations. For field exercises and, presumably on campaign in temperate climes, the lapels were to be turned back so that the coloured plastron did not show. There are very few photographs showing the tunic worn this way after the Zulu War. 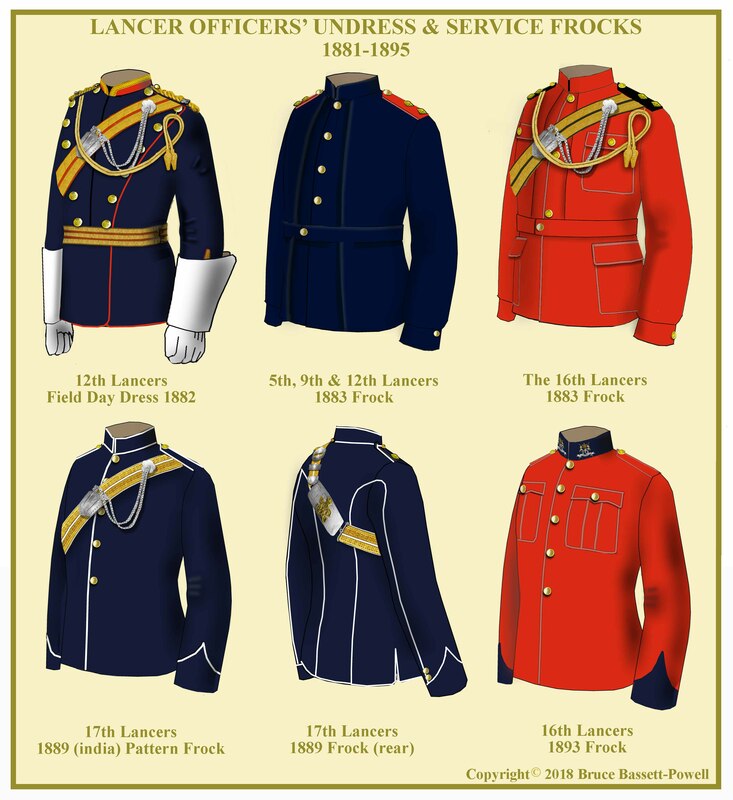 It is interesting that the dress regulations describe the tunic in a manner that suggests that the coloured lapels would only show on parades and levees. However, by now officers of all cavalry were wearing undress frocks for field service and Lancers were no exception. The 1883 regulations continued to refer to the Dragoon Guards and Dragoons for the pattern of undress frock. At first the garment was worn with shoulder straps the colour of the facings. As usual, on foreign stations and perhaps even at home some regiments adopted regimental distinctions such as piping on the rear of the jacket and on the sleeves. Officers of the 17th Lancers are shown in a photograph at Lucknow in 1889 wearing such a garment with piping on the pointed cuffs and around the collar as well as the back seams. Officers of most Indian Army Lancer regiments appear to have had undress frocks with piping on the rear seams which may have inspired British regiments serving in India to do the same. The 21st Lancers may have adopted such a frock from the beginning. Photos in Egypt show them wearing a blue five button frock with shoulder scales and patch pockets. The collar is French grey along with the rear seams and pointed cuffs. This frock appeared in photos some five years later when the regiment was stationed at Hounslow and all ranks seem to be wearing it. Another variation was the 16th Lancers where an existing example shows a scarlet frock with blue collar and pointed cuffs. 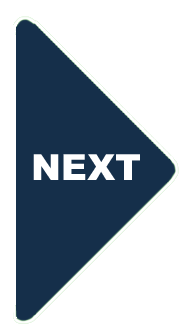 A rear view is not shown. 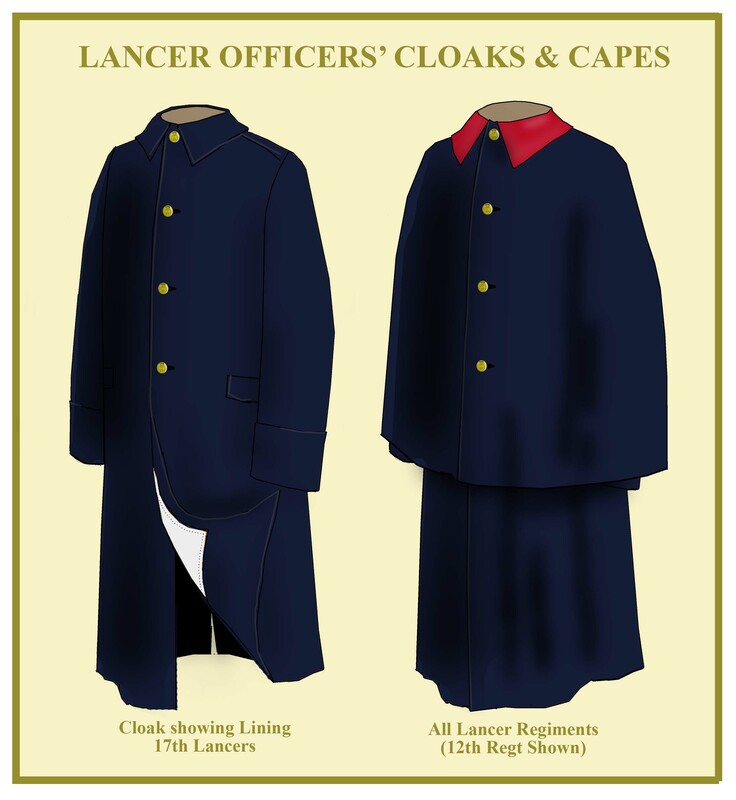 The cloaks and capes of Lancer officers were the same as for Dragoon Guards, Dragoons and Hussars. The lining was to be scarlet in all regiments except the 17th which would be white. There were no mentions of the colour of cape collars until the 1900 regulations which stipulated that the 12th Lancers were to have scarlet collars and the linings of the 21st Lancers were to be French Grey.